Julianne Moore takes her daughter Liv Helen Freundlich trick-or-treating on Halloween. 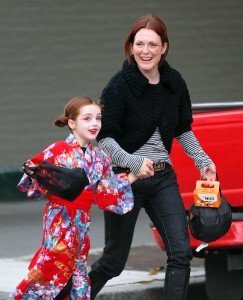 Liv was dressed as a ‘geisha’ and Julianne went without a costume. The happy mother-daughter twosome seemed to be truly be enjoying themselves as they joked and laughed with one and other.